Running into a burning building or home to save lives is just another day at the office for about 24,000 Missouri men and women. The state’s firefighters put on their roughly 100-pound gear and answer the call for help regardless of what level of danger lies ahead. Meanwhile, their loved ones are stuck waiting and hoping they return home safely. 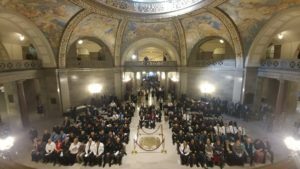 During a ceremony today at the Missouri Capitol in Jefferson City to honor the brave boots on the ground, State Fire Marshall Tim Bean said it takes special people to sacrifice their safety to help others. “Fire service isn’t a career, it’s a calling that attracts selfless men and women willing to run towards danger as others flee,” Bean said. About 200 firefighters from around the state gathered for the event in the Capitol rotunda. Missouri Public Safety Director Drew Juden urged firefighters to take care of their health and fire gear. “Take care of your brothers and sisters. Make sure you’re cleaning it (gear) after every call because that is the silent killer. That is what will kill us down the road and we need to work towards correcting that,” Juden said. According to Juden, 34 people have died this year in a fire – all but one was killed in a home that did not have a working smoke detector. He said there is no reason people should be dying from lack of smoke detectors. Missouri’s Division of Fire Safety and the Red Cross have launched a program -called Sound the Alarm – that gives away free smoke detectors and also installs them for Missouri residents. To request an installation, call 417-380-1148. Governor Eric Greitens, R, said he has great hope in a program launched this year that aims to link military veterans and active service members to fire service careers. An April 28 stop in Cassville will include skills demonstrations and networking opportunities for prospective firefighters.